Sat, Sep 8, 2018, 10:30 am SL Time, ColomboPage News Desk, Sri Lanka. Sept 08, Colombo: Sri Lankan President Maithripala Sirisena has stressed to strictly implement the law against the abusive procedure of ragging in country's higher education institutions which has become a national problem. President Sirisena said the laws to give stern punishments will be implemented in the future against the people who engage in ragging incidents while properly implementing the Prohibition of Ragging Act. Participating in the foundation stone laying ceremony for the Polonnaruwa National Vocational Training Centre of the National Vocational Training Authority yesterday (07), the President further said ragging could not be allowed to happen in universities destroying the future of the university students and the government will launch a special program to safeguard the quality of university education. Speaking further, President Sirisena said the statistics show that over 1500 students, who were selected to the universities, have declined to enter because of ragging. Furthermore, nearly 25 students have died in the last 25 years due to ragging and thousands of students have suffered physically and mentally. The President emphasized that due to the cruel activities of a small number, the lives of the majority of students could not be allowed to be destroyed. The President further said that at present certain political groups have held hostage the university students and those attempts of spreading the barbarism among the children who are to take the future of the country should be defeated. Speaking on the importance of safeguarding the quality of school education, President Sirisena said that in some instances education professionals are still not ready for the reforms that should be implemented in the field of education as a country which is moving forward with the rest of the world. The President said that the enrollment of a large number of students in some schools which are considered as popular schools is one of the reasons for the decline in the quality of school education. Emphasizing the importance of keeping up to date with the new world and modern technology, and changing the traditional views regarding the vocational education, the President pointed out that creating a trained workforce targeting the foreign job market while producing a workforce required for the national production process and industries is important and a necessity. 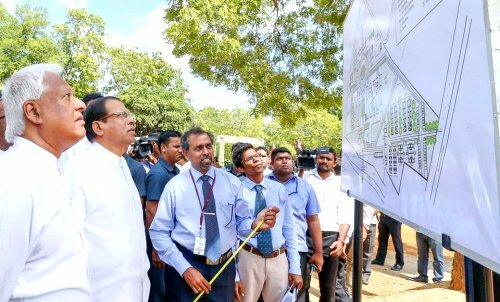 This training center composed of all the modern facilities will be constructed in a land of 17 Acres in Doradeka area in Polonnaruwa on the Hingurakgoda, Medirigiriya Road at a cost of Rs.6.5 billion, with the funding provided by the Government of The Netherlands. This training center, which has modern technical facilities will be providing the training under full time courses of NVQ 4 and 5 levels for 1325 technical assistants and diploma holders annually. Additionally it will also offer semi diploma courses for the professionals. Five training schools will be opened for the fields of construction, Auto mechanics, electronics mechanics, hospitality and tourism, agriculture, and to conduct 34 full times vocational courses. The construction will be completed within 3 years and the training will commence in January 2022. The President, who inaugurated the construction works of the training center made an observational visit of the premises. He also launched the website which contains the information on the development of vocational skills. Minister Sarath Amunugama, Deputy Minister Karunaratna Paranavithana, Chairman of Vocational Training Authority of Sri Lanka Ravi Jayawardena, former Chief Minister of North Central Province Peshala Jayarathna, Ambassador of Netherlands to Sri Lanka Joanne Doornewaard and other dignitaries participated in the event.